In today's heated political climate, we commonly hear, "That's not what the Founders intended" or "The nation's Founders addressed that." What did our country's Founders really say — about liberty, democracy, the role of states, the military, equal protection under the law, First Amendment rights, and more? 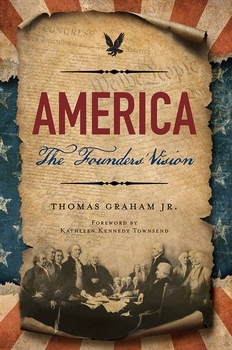 Retired Ambassador Thomas Graham Jr., a former senior US diplomat and leading authority in international arms control and non-proliferation, gathered the Founder's original words from the Federalist Papers, the National Archives, various presidential libraries, and other sources to create America: The Founders' Vision. The Founders knew the temptations posed by power, money, and fame, and they lived in a time when demagogues and other would-be tyrants were not in short supply. Democracy is currently under threat from authoritarians the world over, on a scale perhaps not seen since the 1930s. In this volume, the Founders have much to say that can help us defend democracy today and preserve it for future generations. Ambassador (retired) Thomas Graham Jr. is currently executive chairman of Lightbridge Corporation, a company that develops new and improved types of nuclear fuel technology. He has taught part-time at a number of major universities around the country, including Georgetown University, the University of Washington, Oregon State University, and Stanford. Ambassador Graham gives lectures worldwide and testifies before Congressional committees. He has published seven books on subjects related to international security. Internationally known as one of the leading authorities in the field of international arms control and nonproliferation, Ambassador Graham served as a senior US diplomat in every major international arms control and non-proliferation negotiation in which the United States took part from 1970 to 1997.